The H-1B visa is essentially the visa that allows foreigners from any country in the world to work in the US and eventually have the potential to be sponsored by their for Permanent Residency (or a Green Card). However I should devote at least a small post to what the visa itself is, how in simple terms you get on and all they myths surrounding the H1B. The current quota is 65,000 for people who may be granted an H-1B visa or status. (The numerical limitation was temporarily raised to 195,000 in FY2001, FY2002 and FY2003.) In addition, excluded from the ceiling are all H-1B non-immigrants who work at (but not necessarily for) universities and non-profit research facilities. This means that contractors working at, but not directly employed by the institution may be exempt from the cap. The difference between H-1B visa and H-1B status is that Status is granted usually as a transfer while you are within the US, where as a Visa is granted by a US Consulate or Embassy outside the country. If you are on H-1B status, if you leave the US for travel, you will have to apply for your visa at a consulate abroad. The H-1B visa allows you to travel in and out of the US. Free Trade Agreements allow a carve out from the numerical limit of 1,400 for Chilean nationals and 5,400 for Singapore nationals. Laws also exempt up to 20,000 foreign nationals holding a master’s or higher degree from U.S. universities from the cap on H-1B visas. Renewing a visa does not count towards the annual quotas. A change of employers only count when transferring from an employer exempt from the limits (academia or research) to one that has no exemption. 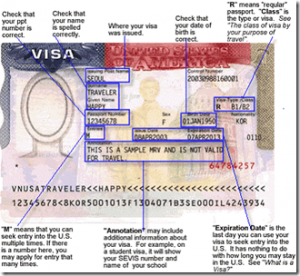 What Does The H-1B Visa Look Like? Good to read your articles every once in a while. I wanted your opinion on my situation right now. I had completed my Masters in CS in 2007 and then my OPT ran from May 2007 – May 2008. I was on a project for 6 months during OPT with Texas Instr but found it almost impossible to file for H1B due to the quota issues and the bizarre immigration laws adopted by the US GOVT in the recent past. Hence had to leave for home. Currently I am in India wondering how I can find a H1B sponsor from here? I know it is immensely tough to hunt for a good H1B sponsor firm (excluding the body shops/ consultants) from India. So I would like to know in detail if & what options do you think are the best possible in my scenario?? I see there are quite a few Masters quota h1bs left and I dont want to miss this chance. Yes in the years you were applying it was tough because of the competition, now it is tough because of the economy. The best advice I can give you is the post I have hear about finding work in the US given you are abroad and the sacrifices you have to make to do it. In your case b/c you have a US Masters degree and US work experience with a well known company, you certainly have a greater chance than the average person. Try https://visacoach.org/2009/09/06/top-4-tips-to-get-your-us-to-work/ or https://visacoach.org/2009/01/19/which-are-the-best-places-to-find-a-job/ which probably contains a lot of info you already know but on the all posts page, there is probably helpful resources as well as the company list pages and visa resources page. of flying in with a B1 tourist visa many times but I hesitated, because I suspected that my B1 will not get approved due to prior history of F1 and work in OPT. Dont you think the officer will suggest I might be travelling for jobsearch? If so, how do i tackle this? Second, what do you reckon of picking up recruiter contacts from websites like spoke.com? and do you think emailing recruiters directly will fetch any responses especially when they will realise I am not in the US? Thanks a lot. Keep the good work going. You are welfare by yourself. Thanks again. Well on the B1 visa I am sure you will do at least some sightseeing so you would not be lying to say that you are a tourist. You are certainly eligible for the B1 visa regardless of your previous F1 visa and OPT status. I am all for trying everything so emailing recruiters is fine. Maybe sign up for a US number via Google Voice or Skype for a small fee so as not to discourage employers and recruiters from contacting you. Great I will surely try getting a phone number. Thanks for your help. I really hope things work out for me. I hope they revamp the whole system. Its ironic they make legal immigration so complex whilst there are 1000s jumping in south of the border everyday! I am from the UK and work in publishing. I have a job offer from a US publishing company who are willing to pay me $30k / year and take me in on an H-1B. The prevailing wage for an ‘editor’ is over $42k, so unfortunately I cannot use this job title / SOC code for my Labor Condition Application. Is it possible to use a different code (e.g. for ‘Proofreader/Copy Marker’ or ‘Media and Communication Workers, All Other’) which is less close to the job I will be doing but whose prevailing wage is lower than the $30k I have been offered? Or are these lower-level SOC codes deemed unsuitable for H1B applications? I have a 4 year UK BA degree in Modern Languages (Russian and German). i just love you blog. I’ve read a lot of forums and articles about h1b visa but your blog is definitely the best. It’s a pity that getting visa is so complicated and based on luck ( the lottery system). It just makes me want to go to the States as an illegal (that’s a joke). But any case I’m 22 years old woman, graduating from uni this year and planned to go to the States in order to get my Master’s degree. I had a plan of getting a job there and raising funds first but after reading your blog it just seems impossible. Do you have any information about the situation there nowadays- are employers willing to hire an “alien” and become sponsor? My field in not connected with IT, I’ll get my degree in business administration and my experience is from marketing. I’m also trying to find a job being in my home country (Estonia) using monster.com and other sites but I assume I shouldn’t get my hopes up. I’d appreciate if you’d give any feedback and your own opinion about my problem. I had some time to think about the subject and some new questions arose. Firstly, provided I’ll graduate this June ( I will for sure ) means basically that I cannot apply for work visa this year? As I’ve read from your posts the number of applicants exceeds the number of visas actually given and if I apply for visa in June I’m too late probably…I bought Skype US number as mentioned here but the problem with interview still remains. I assume I should fly to the States in order to have an interview..ugh, so many questions and so much confusion. I’m from Kazakhstan. Also, lived in Japan for 6 years. I’m current exchange student in USA. So simple question…. is it impossible to get H-1B sponsor without Master Degree or BA Degree?? My wife entered the united states illegally and was wondering if she can qualify for a H1B Visa? If she does, will she have to face a penalty for entering illegally?